Bachelor of Pharmacy(B.Pharm.) is a 4 year undergraduate program which is compulsory for anyone who wants to practice as a pharmacist. B. Pharmacy is study of preparing and conferring drugs and medicines for a number of illnesses and deficiencies. Pharmacists are needed in every location and every hospital, due to which the scope of this course has increased positively.The program has been bringing out healthcare professionals from a long time and would continue to do so for years to come as the field is growing at a fast pace. The minimum eligibility for admission to this program is 10+2 or Higher Secondary Examination in Science subjects. Approximate course fee is INR 95,000 per annum. After the completion of course students work in pharmaceutical industry where they are offered a decent package and resourceful learning experience.Entry level salary for a Fresher in the Pharmacy industry is around INR 1.8 Lakh per annum. Admission Process Direct admission to colleges. However, some colleges may check student's skills in through an entrance test. Top Recruiting Areas' Pharmaceutical companies, hospitals, healthcare centers, medical camps, school and college laboratories, Medical Technology industry, Medical equipment companies, Homecare industry, Medical imaging industry, Pathology Laboratories, Academic Institutes, Research & Development centers, Entrepreneurship, etc. Top Job Profiles Analytical Chemist, Food and Drug Inspector, Hospital Drug Coordinator, Drug Therapist, etc. Bachelor of Pharmacy: What is it about? Bachelor of Pharmacy (B.Pharma) covers all the facets of healthcare including bio-chemical areas that concern the preparation of medicines and implementing those for the right diagnose. Prevailing modernization in the field of Pharmacy has globally increased its value.Bachelor of Pharmacy engages studies of all those subjects that therapeutically help people provided from their medicines. The course is versatile and dynamic as it offers jobs in various fields like R & D, Manufacturing, Quality Control, packaging and much more. What do you learn in B.Pharmacy? B. Pharmacy is all about maintaining a standardized quality of people’s health and living. As a student of B. Pharmacy, you learn about the medicines and their effect on human body, with details of the chemical and organic properties of all the elements used. The program teaches students how to become attentive professionals so as to ensure selection of a right drug for right treatment for which all topics of pharmacology, chemistry, pharmaceutical chemistry, biochemistry, kinetics, pharmacy management and compounding medications are covered. Students can opt for Master of Pharmacy after completing B. Pharmacy successfully or they can also go for MBA in Health Care Administration. Students applying for Bachelor of Pharmacy should have 50% in 10+2 with physics, chemistry and mathematics or physics, chemistry and biology. Students having Diploma in Pharmacy can also opt for this course. 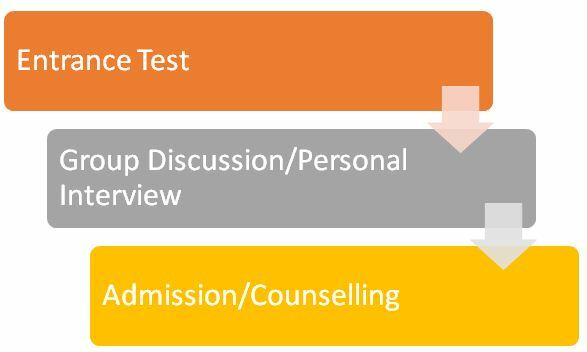 This is the basic process that most colleges in India follow in which students after getting short listed in Entrance exam are required to clear the group discussion and personal interview round. BITSAT: BITSAT is Birla Institute of Technology and Sciences Aptitude Test that is conducted for seeking admission in B. Pharmacy courses. It is generally conducted in the month of May. WBJEE: WBJEE is West Bengal Joint Entrance Examination is also conducted in the month of May generally for admission to Bachelor of Pharmacy course. TSEAMCET: TSEAMCET is another exam that also gives admission to B. Pharmacy and is conducted in the month of May. All these parameters determine selection of students for admission to Bachelor of Pharmacy. Students who are toppers of their respective boards do not need to appear in BITSAT and can get direct admission in BITScampuses. Bachelor of Pharmacy: Who should opt? Students who are willing to work around medicines and have a good aptitude towards pharma industry can opt for this course. This course is also ideal for people who wish to open or own a chemist shop and have strong business skills can also opt for B. Pharmacy. With a degree of Bachelor of Pharmacy, a student can register with the State Pharmacy Council and open their own Chemist shop to stock and sell medicines. Analytical Chemist Analytical Chemist has to look after the elements used in a compound and its reaction with other elements. Food and Drug Inspector Food and Drug Inspector is required to collect samples of products bacteriological and chemical laboratory analysis and check manufacture of foods, drugs and cosmetics. Hospital Drug Coordinator Hospital Drug Coordinator has to prepare medications under the directions of a pharmacist and manage dosage as prescribed. Drug Therapist Drug Therapist are required to counsel people who are addicted to prescribed or illegal drugs. Regulatory Manager Regulatory Manager has to study scientific and legal documents and organize various formats.